You read the correctly. It is true: I didn’t type the opening of my book. Here is the opening that I didn’t type. The siren screamed. Had they blown their cover? The red flashing lights indicated that something was not right. Trey looked down and saw a red dot projected on to his foot. The red dot was the type made from weak laser beams that are used in security systems. I Graffiti®‘d it instead. It’s a way to enter text in to Touch Screen-only devices pre iPhone. It was common on older Palm Devices, as it was one of two ways to actually input data. It worked by detecting certain movement from on the write section of the screen. Except, in most cases such as the M100, as seen here, it’s not actually a Display Area. I used to own the Palm M100, which had very limited data space. I could fit only a few Ebooks, there was barely room to fit the full bible, just on it’s own. The Ebooks standard PalmDOC was one built for small file sizes. You could fit a few novels on one, but not the entire library. I got a few other applications on it, which I was surprised to squeeze on. After reading a few Ebooks, I created a note in the device’s default organizer functions, one night, and “typed” the opening scene. The notes where synced to the PC using the bundled software, which acted like the desktop version of the Organiser. One in the software it was easy to copy and paste to and from the Word Processor, which a the time was OpenOffice.org, before it was called that. Palm Organizer showing my schedule for 11 September 2004, “To Do” tasks are “jokes.” No Personal Data is shown. Winamp is playing a Music track from OCRemix. This screen shot was actually taken on 4 Sept. 04 for Public consumption. Around this time, Smart Phones where not common. There where all expensive Business models, with bills to match. Wifi was rare at this time, and not many people even have heard of it. I not only knew about it, I happen to own a Router. Typing on a PDA forced you to not to concentrate on formatting, as there was no controls that I could use. You also had a character limit per note imposed by the hardware, I discovered this the hard way after losing a scene. Did I stop writing on my PDA? No, I actually continued and wrote the original Draft for Soju Masters: The Fall, using the Windows Mobile phone. (Top) It had a cut down version of Microsoft Word installed as standard, and the ability to sync the file to the desktop automatically. I could now use Bold and Italics if I wanted, but the few years with the M100 left a mark and I hardly used it. I also found such a good deal that offered me Free internet. When the Windows Mobile Phone battery failed, I needed a new phone. Windows Mobile was not that big on the Market Place, the iPhone was new and too pricy for me. The Android Phone G1 was out, but the Lack of apps meant that my writing would take a hit. I replaced it with hardware that I expected to work. This was the BlackBerry 8320. It did everything that I was expecting to do at the time. Except the interface was not useful for writing. It didn’t matter much, as I was at home most of the time, and wrote in the house. The Windows Mobile phone regulated to PC and Wifi connection only, still did occasionally go on trips for when I wrote. After a while, I discovered that I needed to get on a cheaper contract. 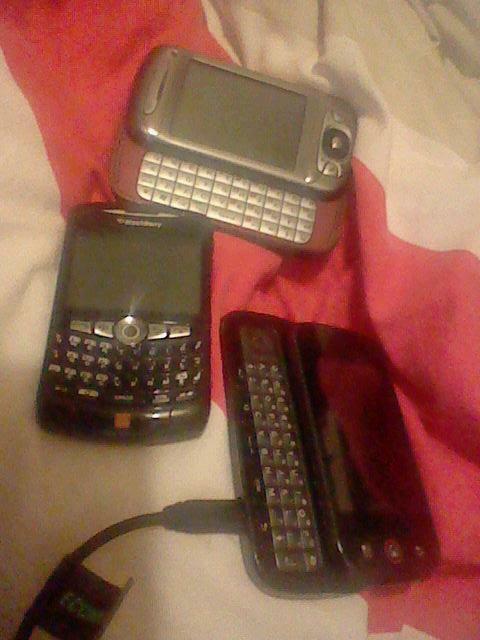 This where my current phone the Android Motorola DEXT/CLIQ. Android now has access to my Google Docs, via the GDocs App which now holds the current draft of Soju Masters: The Fall. It now is saved online within a few seconds saving over the Phone’s 3G network. I then can access it from most online computers. If think you can’t write a book on a Smart Phone. I not only Beg to differ, I’m actually writing significant parts of it on one. A piece of Paper can be used for many things, writing a part of a novel on it is one of those things.